Portal Inbox.lv continues to improve and expand its product range! From now on, all inbox mail users can use a new product – Inbox Calendar! Inbox electronic calendar is a modern alternative to paper calendar – you can schedule meetings, appointments and events, receive reminders about them and share your calendar with your family, relatives, friends or work colleagues! An increasing number of the world population in their daily life prefer to use electronic rather than traditional paper calendar and undoubtedly – electronic calendar is much more convenient and easier way to plan your everyday life. • Possibility to make several changes in created events. 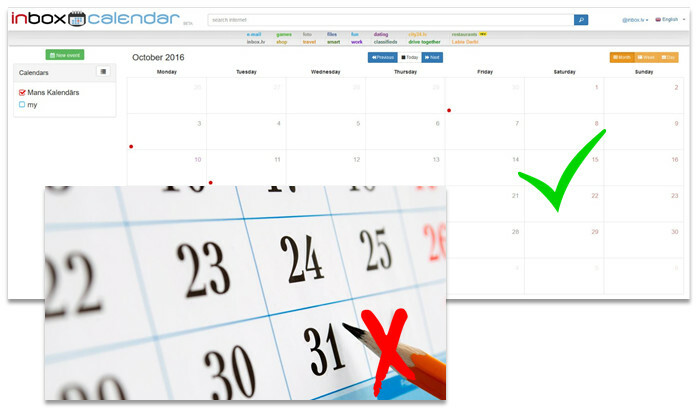 You will no longer have to write and then cross out and write again in the paper calendar every time when you change your plans! • Event sharing with other people. This feature is very useful especially when you plan to join an event, such as meeting with work colleagues! • Reminder messages for any of the calendar added events (The reminder message will be sent to your mailbox in form of a letter). This is the first version of the Inbox Calendar, and it should be noted that with each next version, this product will become more and more comfortable and it will provide more useful new features! Log in to your mailbox and start to use Inbox Calendar! This entry was posted in About our products, Ziņas and tagged calendar. Bookmark the permalink. E-mail notifications on your desktop!